will be paid the minimum wage. The policy is having a dramatic effect in that sector. In others, such as the public sector and finance, where pay is higher, the minimum wage has barely had any effect at all, and even the recent rises aren’t changing that. The point of the minimum wage, of course, is to increase the wages of the lowest paid. The chart below shows that this goal has been achieved. 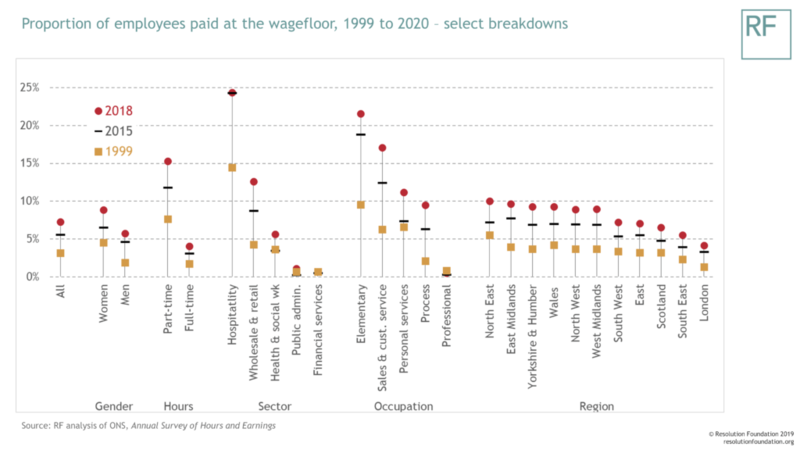 Over the last twenty years, hourly pay growth has been strongest at the bottom of the distribution. 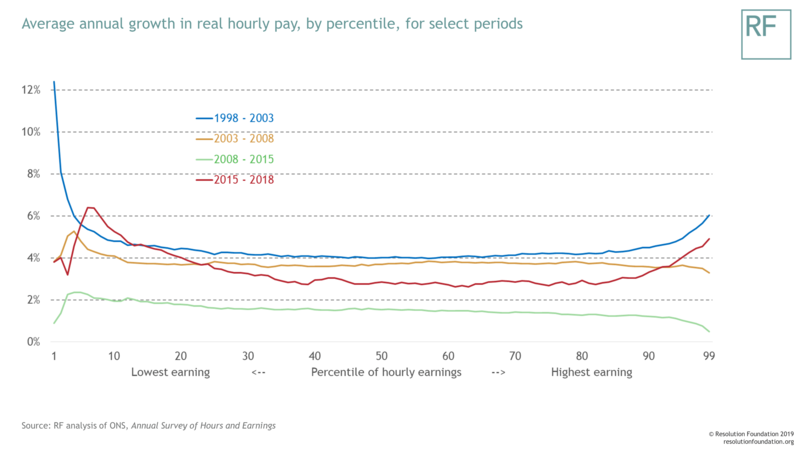 The period after the policy’s introduction (1999 to 2003), is particularly striking, as is the impact of the recent NLW increases, with strong hourly wage growth for lower earners in the last three years. Monday’s uplift will see the NLW increase by 4.9 per cent, well above the current growth in average pay (in January the annual growth in average nominal weekly earnings was 3.4 per cent). The debate has now turned to post-2020, with the Chancellor mooting an even more radical policy of ‘ending low pay’, which, based on the most widely used definition, would mean the minimum wage being set at 66 per cent of median earnings. This 66 per cent ‘bite’ would represent a leap into the unknown. Arin Dube’s review of minimum wages will help, but he will have scant international evidence to draw on for such a high bite. Of rich countries only France’s bite is comparable, and that’s only 62 per cent. What’s more, the differences between the two countries will make it hard to learn lessons directly. For example, in France most jobs are covered by collective bargaining arrangements, and there are extensive subsidies for employers hiring the low skilled and the young. Still – the Chancellor’s ambition is laudable, and a far cry from back in 1999 when the Conservatives opposed the minum wage’s introduction. Today’s political consensus on the minimum wage is highly welcome. On its twentieth birthday, it is pleasing to reflect on how far the minimum wage has come. Where once it was seen as a job-killer, now the only question is ‘how high?’.